Researchers in natural Medicine have been looking at an alternative form of natural medicine for curing common colds. Various researches have been conducted in the recent past by natural medicine experts. Most of the research results point to the combined beneficial effects of Zinc, Echinacea and Vitamin C in treating common cold. Natural Medicines that contain Zinc, Echinacea and Vitamin C have proven to be extremely effective in curing common cold. The combination of three ingredients boosts the immune system response and helps the patient to get immediate relief from cold symptoms. A study was actually conducted at the Detroit Medical Center in Michigan. As part of the research study, Zinc Lozenges containing a mixture of zinc, echinacea and vitamin C was administered to a set of people with cold symptoms. People with cold symptoms got complete relief within 4 days of consuming Zinc Lozenges. The duration of coughs came down from the initial 6.2 days to 3.1 days after administering Zinc Lozenges. Similarly, there was another study conducted at the Cleveland Clinic. The employees of the clinic volunteered themselves to be part of the tests. The average duration of the cold symptoms came down from 7.1 days to 4 days. The employees were provided with Zinc lozenges within 24 hours of the onset of cold symptoms. Zinc ions actually interfere with the replication of cold viruses in the throat. Additionally it boosts the immune system to the required levels needed for fighting cold causing viruses. Herbal Remedy Experts have recommended taking 20mg of Zinc Lozenges every Two hours from the onset of cold. There are more than 300 journal articles that have published the positive effects of the herb Echinacea in boosting the immune system. Echinacea is a flowering plant that grows in large numbers in the North American Continent. 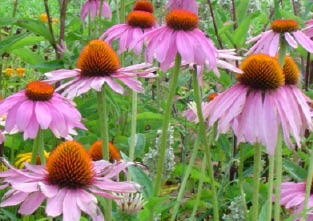 Herbal Medicine experts have recommended patients to take 6 to 8 capsules containing Echinacea, when suffering from cold. When used along with Zinc, Vitamin C and Vitamin A, Echinacea have been found to be extremely effective in containing cold. This herb is actually extracted from the leaves and root of the herbal plant and encapsulated for easy consumption. The herb is rich in antioxidants glyconutrients needed for boosting the immune system . Vitamin C also plays a crucial role in the enhancing the immune system. Ascorbic acid has been proven to be extremely effective in improving the white blood cell count. It can also increase the production of macrophages. Macrophages comes with the required capability to engulf and destroy cold causing viruses. When used along with Zinc and Echinacea, it becomes more potent by substantially increasing the secretion of macrophages. Zinc Lozenges containing a Vitamin C dosage of 500mg to 10000 mg is more than sufficient to kill the cold causing viruses. One can consume as much as 10 grams per day of vitamin C once a tolerance has been built up. The average does is 1000 – 4000 milligrams per day. It is always wise to keep a bottle of echinacea, zinc, and vitamin C on hand because you never know when that nasty cold will get you.